I'm such the impulse buyer. As a result, eBay is both my friend and enemy. I realized I had a problem when I found myself bidding on and winning a Smurfs Thermos. Why I needed that 80s lunch box item? I'm still not sure. I just remember tripping out my classmates in grad school when I poured tomato soup from it during our dinner break. So, knowing how quick I was to online shop, I wasn't too sure about my recent purchase from HSN.com (yes, the Home Shopping Network). I had seen an ad for a beauty product called Eye Majic, which are these decals that apply eye shadow designs easily to your lids. Since I'm one of those people who freak out when objects go near my eyes, I'm not the best at being artsy when applying eye liner and such. I still can't use an eye curler, or as I call it--the eyelash guillotine. The deal breaker for me though was seeing that the "normal" price of $20.00 was red lined down to $17.00 and that it was free shipping and handling, so I bought two sets, one of their warm colors set and one of their cool colors. I'm glad the normal colors worked. 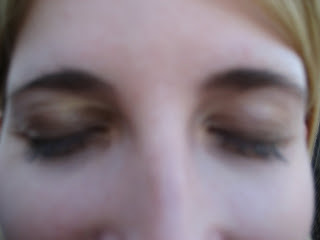 I am such a train wreck at putting on eye makeup as well. I always tend to leave the house resembling a raccoon, or the victim of a boxing match gone in the other fighter's favor, one. It eventually faded throughout the night, but it didnt get all over my cheeks and worked into the creases nicely. Looked good while it lasted.